The recovery is going to take a lot of time. Russia was a first for us, yes. But in the US we’ve performed a number of times. It was a fantastically successful tour; unfortunately, it ended on a bad note. You’ve had shows in a number of interesting places—from the Edinburgh Fringe Festival to Moscow’s Gorky Park. Which have been the most memorable? When you’ve performed more than 800 shows, it’s very difficult to say which are the most memorable. Each show is a beautiful experience for us. It was great performing in Moscow, where 99% of the crowd was Russian. There’s a different thrill to play for people who do not know your music, and you convert them on that one particular day. Any upcoming film projects you’re working on? One is an Aamir Khan production (directed by Anusha Rizvi). Then there’s another called Bhoomi. A third, which is an Indo-Australian production, we’re in talks with. Does Indian Ocean’s activism go hand in hand with the music? We’re not a political band at all. We are aware human beings, and we will be concerned with certain things happening in the world. I’d also say that looking only at the political aspect of a certain song is flawed...you lose out on the larger essence of the song. Do you follow any other contemporary Indian indie artists, such as Avial or Mrigya? I don’t get the chance much, we’re continuously caught up. Mrigya I’ve heard. Avial I haven’t. I like Kailash Kher’s singing, and Shubha (Mudgal)’s singing is also fantastic. I like Mrigya too. The ‘fusion’ tag that’s sometimes attached to your music…do you agree with the use of that term? No, we don’t. We call our music “Indian Ocean music" because no one has been able to pigeonhole our music into a phrase. In my mind, “fusion" is basically about two people, maestros in their own field, coming together to see what kind of musical conversation can happen. We’ve all grown up in the same place, and have similar influences, though our musical tastes may vary. And none of us are trained musicians! 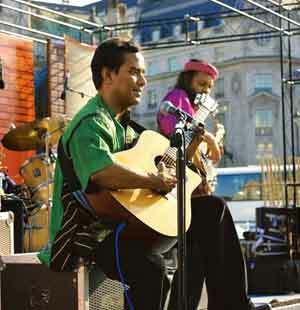 Indian Ocean will play in FROGfest 2009 on 14 November, 5pm onwards, at The Garden of Five Senses, New Delhi. Daily passes are available at the venue for Rs750.